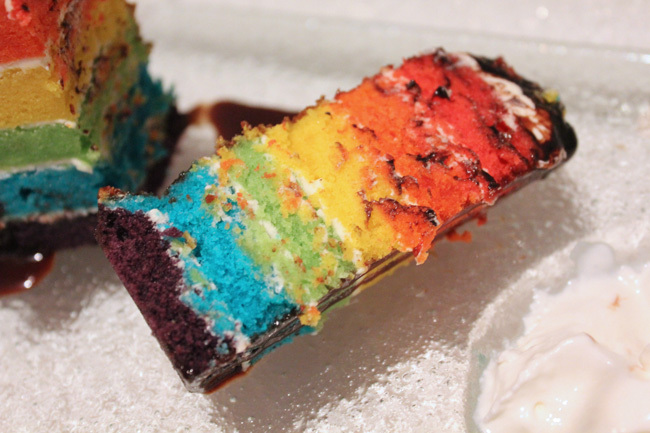 The Rainbow Cake seems to be the next big thing in the world of cafes and cake shops. If all cakes would to join a beauty contest now, this visual treat would win hands down. The most popular Rainbow Cake in Singapore is from The Production Kitchen by Jacqui Co (in the midst of relocation), also famous for its carrot and chocolate cakes, and Madagascar vanilla bean cupcakes with salted caramel frosting. They are often swamped with orders, and making each is too labour-intensive. Its customized 7-inch rainbow cake cost a whooping 100 bucks though. 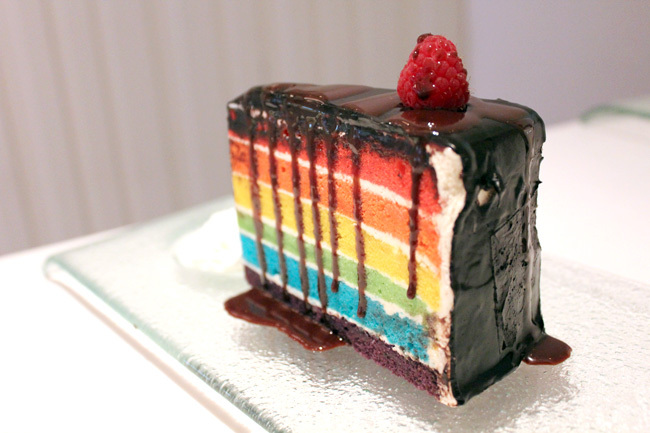 I had my Rainbow Cake at Le Chocolat Café for $7 a slice, recommended by my friend Elaine and the reliable i-weekly. When the cake arrived, we almost went for an orgasmic “wow”. The bright red-orange-yellow-green-blue-dark purple cake was covered with chocolate and dripping beautifully with chocolate. It felt like chocolate rain over the velvet sky. 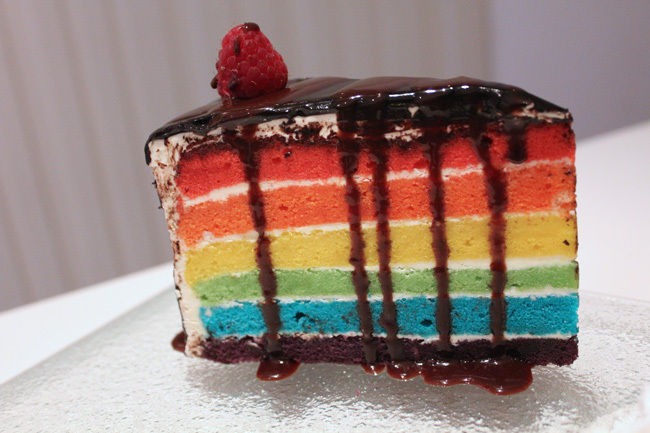 What the Rainbow Cake can promise in beauty, it may not in taste. Every layer was almost too sweet, possible over-enhanced with the food colourings. And if you closed your eyes to eat them, it would just feel like a saccharine butter cake. Other places which sell the Rainbow Cake in Singapore include 1 Caramel Dessert Boutique, Designer Bakes at Centrepoint and My Fat Lady at Haji Lane. Drop a comment here if you know of anywhere else. ← Wheat Baumkuchen – Healthy Penguin, Reindeer, Whale and Seal Noodles. Not as pretty as Production Kitchen cake leh. 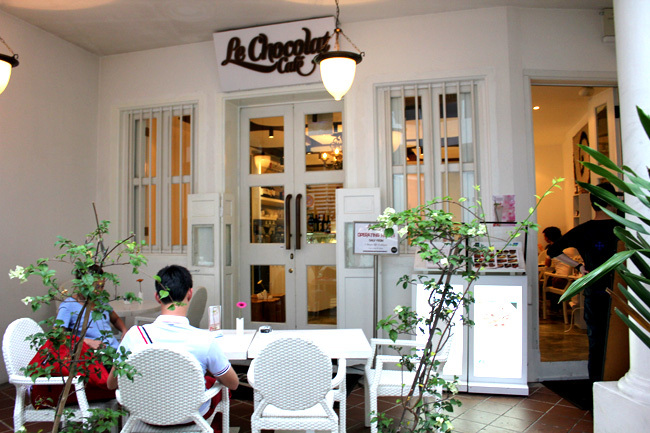 I find Le Chocolate Cafe cakes overly sweet in general. looks like there is a craze over rainbow cakes! Have your tired La Petite Home Bakery rainbow cakes? My friend bought it for my birthday and it was suberbly nice. They does really nice rainbow cakes. It comes in different flavours too. I personally love their passion strawberry. They add mousse and fresh fruits inbetween layers of sponge and it’s not too sweet. Thanks rainbow lover for promoting our cakes! We are a patisserie specialized in doing rainbow cakes! Have u got a physical store yet? Ooooo I’ve tried this before and love it too Their coffee are also quite good. hi, do you know where to get a slice of rainbow cake? Hi, may i know the price of a 1kg and 2kg rainbow cake, and how many days in advance do i need to order the cake? Hi, do you have any other photo for the design of cakes for kids? And did you do any delivery? Oh, that’s bad. Which cake was it? The rainbow? I believe I have read about the rainbow cake sold at “The Medz” when reading a review about the place. It’s the basement “foodcourt” style restaurant at the basement of Orchard Central. Not sure if they are selling it since the review was about a year ago. Hi, I’m a great fan of desserts and rainbow cakes. After trying majority of the rainbow cakes in Singapore, I’m recommending La Petite Artisan Rainbow Cakes! It beat them all hands down with even a better option to be able to customised rainbow cakes without even using fondant!… Even my friend who don’t like eating cakes loved my son’s birthday cake to bits! Their vanilla bean mousse rainbow is the best vanilla cake I have ever tasted… And all my mummies friends are their fans now! Shop is at toa payoh. Worth trying out but you need to book early as they are always fully booked. Here’s their facebook page.